I recently discovered that painting is a stress reliever for me. The more stress I go through, the more I want to paint and create. I’m sure everyone has an alternative they turn to when times become a less than optimal. That being said, I went through a “low time” when my daughter was about 6 months old. She never slept, she was always screaming, and I also had a 3 year old to take care of. Let’s just say my tank was empty. So, what next? Project time; or more specifically my modern farmhouse MILK PAINTED TV STAND UPDATE. I bought this TV stand about 5 years ago. It had a real “shabby” finish on it (even a little too shabby for me). I decided I wanted to refinish it and create a more “modern farmhouse” finish with a brighter white color. It didn’t look bad, I just felt like it needed a little “up cycling!” Time for a new furniture project. First I needed to decide on a paint color and then a paint. I decided to use Antique White milk paint made by General Finishes. I feel the brighter white colors match my modern farmhouse style a little more than the old dingier creme colors. I love this stuff! It doesn’t require any real “prep work (most of the time at least),” goes on smooth and doesn’t require a top coat. This is a great paint for those DIYers who don’t want a lot of steps when refinishing a piece of furniture. Full disclosure; all milk paints are different. 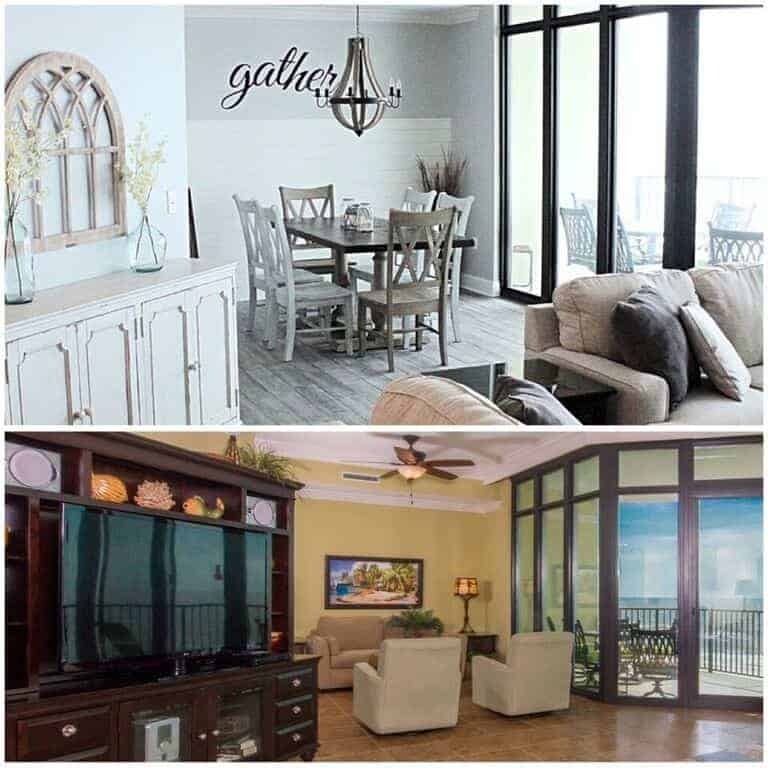 For this post, I’m speaking about General Finishes. You can see another post where I used a completely different kind of milk paint product HERE. You can click on my affiliate link below and find this product. I’m really liking the milk paint better than chalk paint these days. You can see more about Chalk paint VS. Milk paint in another post HERE. 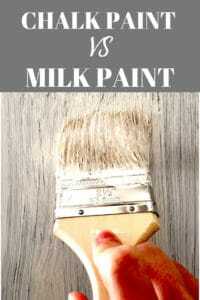 Milk paint has a smoother, slightly glossier finish than chalk paint (the General Finishes brand, not all milk paints). 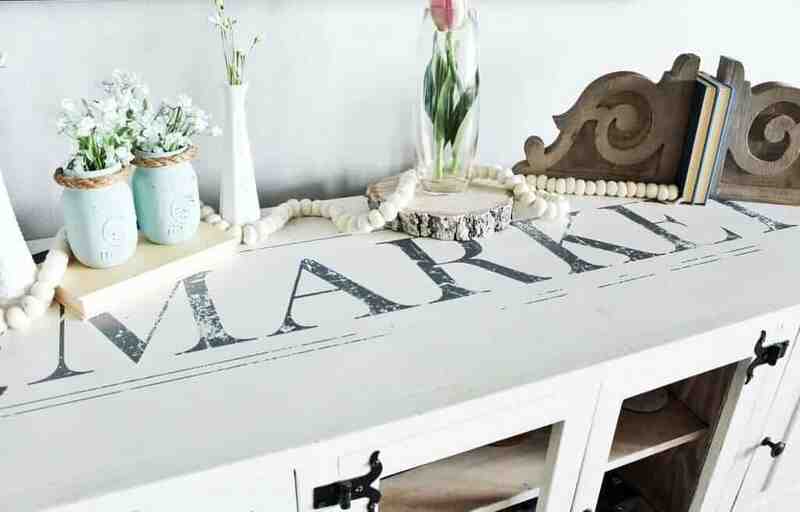 Chalk paint requires a top coat or wax, otherwise it will rub off easily. I have found that milk paint doesn’t always require a top coat and is a little more durable without it (these are 100% my opinions only). If you want to know more about Chalk paint, you might find THIS post useful. 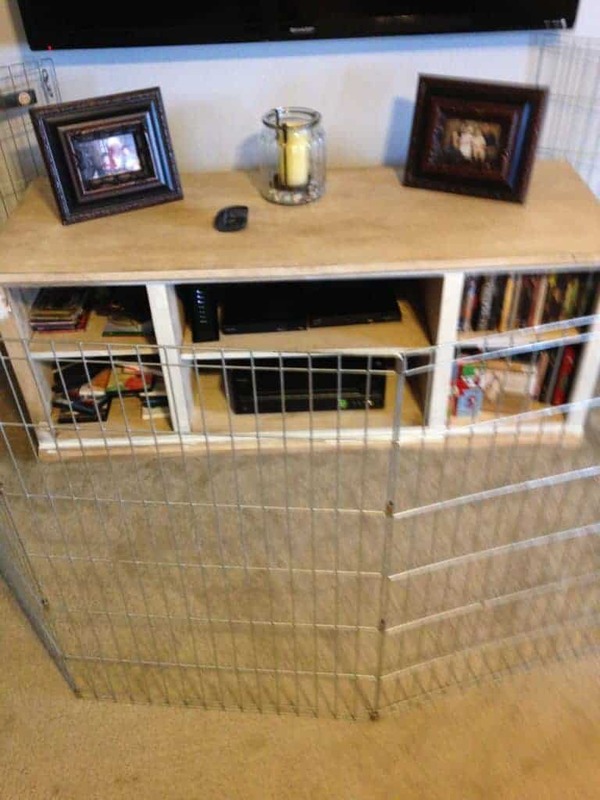 So here I go… notice the “cage” I had to use to enclose the TV stand so my sweet but nosey child wouldn’t terrorize it! Since the current color of the TV stand was already a light color, I only had to use one coat of paint. 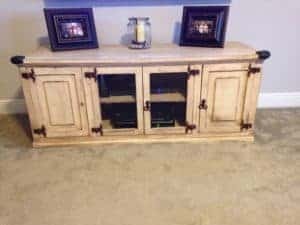 I could have used another coat, but I like the more “rustic” distressed furniture finish. The last thing I did to complete the TV stand update was to spray paint the existing hardware. I used an antique bronze color spray paint (I’ve used all different brands, they all seem to work about the same) to spray the hinges. I replaced the knobs with pulls I bought at Lowe’s because in my experience, anything you continually touch doesn’t need to be spray painted. Using the spray paint for light fixtures, hinges, or anything that requires very little touching is perfect. For knobs (which are used continually by my little ones) the spray paint will probably NOT hold up. I like the new clean white look. It still has an old vintage feel, but with more of a modern farmhouse touch. I added a vintage inspired furniture transfer by Iron Orchid Designs. I love the way it transforms my milk painted TV stand and makes it a little more personal. Come on over HERE to see a post all about image transfers with IOD. Best part about this furniture makeover? It was virtually free! More importantly, it was an escape for this tired mama! Thanks for stopping by and I hope you’ve been inspired to repurpose or up cycle something of your own. Want to see more posts about painting furniture? 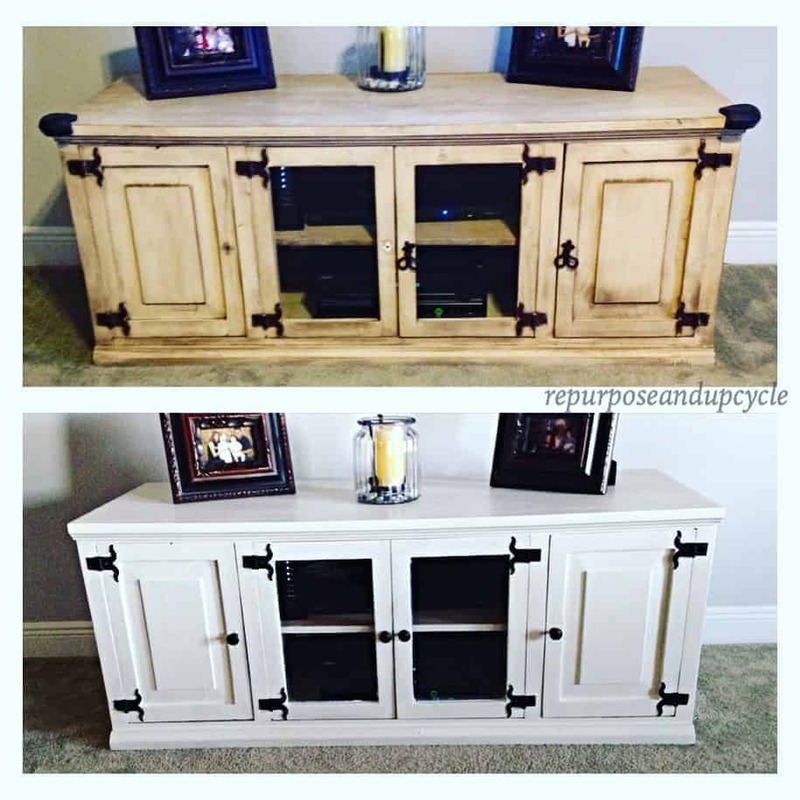 You might enjoy my Painting and Refinishing Furniture category HERE.